Southerners know how to make the best-tasting tuna salad sandwiches! The chopped hard-boiled egg and chopped dill pickle or dill relish are typical additions to a Southern-style tuna salad. Or, for a sweeter flavor, use chopped bread and butter pickles or sweet relish in the filling. To stretch the tuna further, add an extra hard-boiled egg. 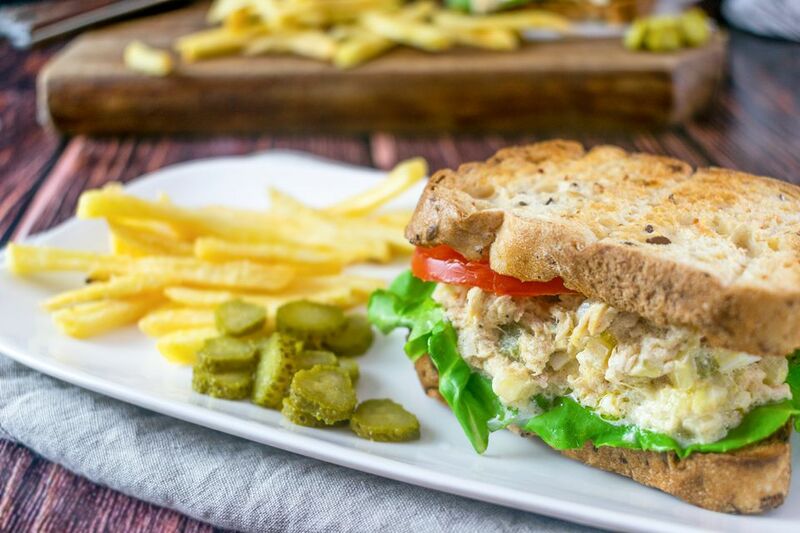 This tuna salad recipe calls for canned or packaged white tuna, but feel free to use fresh poached albacore tuna (see below). White or albacore tuna is mild in flavor. If you prefer stronger tuna flavor, you may choose to use light canned tuna, which might include skipjack, tongol, or yellowfin. You might even choose to use tuna packed in oil if you prefer that flavor. Serve these sandwiches with potato chips or French fries for a satisfying lunch or sandwich supper. Or serve them with a cup of tomato soup. If you prefer a low-carb option, serve the tuna salad on lettuce leaves with sliced tomatoes or avocado wedges. Transfer the tuna to a medium bowl and flake it with a fork. Finely chop the celery and hard-boiled egg and add them to the tuna along with the mayonnaise, and chopped dill pickle. If desired, add 1 or 2 tablespoons of finely chopped onion, chopped parsley, or Dijon mustard. Taste and add salt and pepper, as needed, and more mayonnaise, if desired. Toast or grill the bread or rolls, if desired. Line the bread or rolls with lettuce leaves and spread the tuna salad on the lettuce. Add a slice or two of thinly sliced tomato, if desired. Serve the tuna sandwiches with sliced dill pickles and potato chips or French fries. If you wish to use fresh albacore turn, you can poach it to use instead of canned tuna. Put 2 to 3 (4-ounce) albacore tuna steaks in a sauté pan of simmering salted water. Cook until the tuna is cooked through, about 3 to 5 minutes. Drain well and flake the fish. Continue with the recipe. To make hard-boiled eggs, place one or two large eggs in a small saucepan and cover with water to a depth of about 1 inch above the egg. Bring the water to a boil over medium-high heat. Cover the pan and remove it from the heat. Let stand without removing the cover for about 15 minutes. Pour cold water over the egg. When the egg has cooled, peel and chop it, and then add the chopped egg to the tuna salad. You can substitute 1 to 2 teaspoons of finely chopped dill for the dill pickle in the tuna salad. For extra color and flavor, add some fresh chopped chives or parsley to the tuna salad. Add zing to the filling with 1 teaspoon or more of yellow mustard, Creole mustard, or spicy mustard along with the mayonnaise. As an alternative to bread, serve in a large tomato cut into a fan shape to hold the salad. For a tuna melt, heap the tuna salad onto bread, and top with cheese and a slice of tomato. Broil open face, brown in a skillet, or use a panini press to heat the sandwich.